This manual is to be used in accompaniment with Financial Literacy by Kenneth Kaminsky. Included in Financial Literacy are hundreds of examples and solved problems, as well as several hundred exercises. 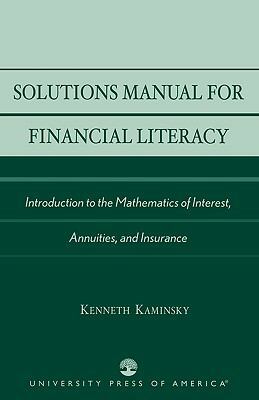 Solutions Manual for Financial Literacy includes the answers to these exercises.Kaminsky, Kenneth is the author of 'Solutions Manual for Financial Literacy Introduction to the Mathematics of Interest, Annuities, and Insurance' with ISBN 9780761826231 and ISBN 0761826238. Loading marketplace prices 99 copies from $55.32 How does the rental process work?